The world is set up for right handed people, that is just the way it is. Unfortunately there are a lot of “lefties” out there that need to make their way in a right handed world. My son Tom is one of those people. He is a natural lefty and does everything with that hand. That is a common trait in our family, my brother is left handed, Jan can use both, her mom is left handed as is her sister. Normally this is no big deal, but learning how to fix watches as a lefty has its challenges. Another issue that Tom battles is he is right eye dominant. Most people don’t really know what this is Here is a brief test to see where you are. Next time you look in a telescope or if you hunt, a rifle scope, which eye do you use?? Most people that are right handed are right eye dominant and lefties are left eye. Tom is the exception to this rule. He is left handed and right eye dominant. You might wonder what the big deal is. This picture shows how Tom works, left hand with a screwdriver looking through his right eye. He needs to cross in front of himself in order to work, a bit more difficult to master, but he has figured it out. When Tom was first learning the art of watchmaking, the first thing we needed to deal with was how to use a loupe and what style we would use. There are 2 options, the loupe that attaches to your glasses, or a standard head band loupe. Both are fine, just a matter of preference. For me when I started, I did not wear glasses and wore a head band loupe for about 18 years, then my eyes started to change a bit and I needed to wear glasses so I switched to a a glasses loupe. Toms problem is he wears glasses, but prefers to wear contacts all day. He did not like a headband loupe, so now we were challenged on how to wear a loupe with glasses and contacts!! Along with our eye doctor, we came up with a simple solution. We bought a pair of glasses that used a lens with no prerscription, just a clear piece of glass. In this way, he can wear his contacts and also a loupe that is attached to his glasses. Simple solution to a complicated problem. One issue that both of us deal with is trying to find a set of glasses frames that will work with our loupe. Most of the current cool glasses have side pieces that are too thick and wont work. You need a thin set of metal frames to hold a loupe. 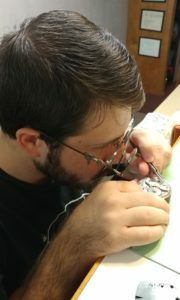 Now onto the issues of actually fixing a watch as a lefty. Sounds easy, but even watches are set up for the right handed world. 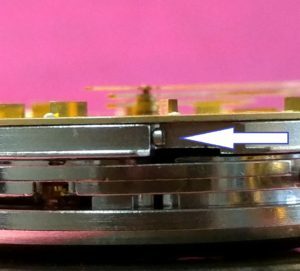 Listed below is a clear example of how difficult it is to simply remove a dial screw on a rolex. The way the watch is made, it is set up for the screwdriver to come in from the right, no way for a lefty to loosen this screw. Tom figured out a solution, he needs to flip the movement upside down, then he can loosen the screw coming from the left side! Another problem for Tom is opening a snap back case. Most case backs have a slot in the back so you can get a bench knife under the back to remove the back. This slot is located in the upper right hand corner of the back, perfect for a right handed person to open it. Unfortunately, it is just about impossible for a lefty to reach around with his left hand and get enough pressure on the back to pop it off. Overall, Tom has made all of the adjustments needed to become a very good watchmaker. He has lots to learn but is well on the way of mastering his craft, a little thing like being left handed won’t slow him down! cause of the personal disclosures that you have had to master in the way that you have. We see cross eye dominance frequently in competitive shooters, They hold with there dominant hand and tilt their head to sight with their dominant eye. I enjoy learning little-known facts like these. One of these days I’m going to send you my ancient Omega Seamaster for a redo, just waiting for the finances. Thanks for your news items. 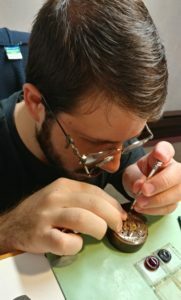 I enjoy these posts and insights on watch repairing. Thanks! 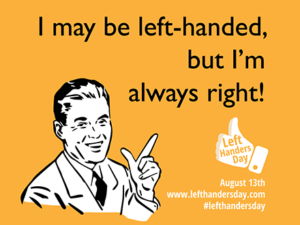 I am right handed, but I also have seen problems suffered by “lefties”. Several well known products have been adapted for lefties. One of these is the Victorinox “Swiss army knife”. I discovered their left-handed knife and bought one for my sister-in-law, a lefty artist. However, many products are not adapted. The M-16 rifle and derivatives thereof are examples, along with bolt action rifles. And, there may be lefty wristwatches, but most just use a regular right-handed model. There is, however, a profession in which being a lefty is a distinct advantage. That would be as a baseball pitcher. Anyone who has batted against a good lefty pitcher will probably agree that is much more difficult to hit against a l lefty. This is interesting. I am into locksport…..that is opening locks without a key. It basically means picking locks or bypassing the locking mechanism. I am left handed, all the tools and educational material are set for right handed people. So I have basically the same issues as a watch maker! This was a great article for thought. This is a lousy place for me to make the next request…..but if anyone here has locks with no keys, boxes of unused keys, old locks or related stuff…..the locksport community would like to acquire what you have for fun and repurpose! Like Son!Great Post, thanks.It is a Right hand world…mostly. Mark, some time ago after seeing you and your son in your photo, I noticed your son had his watch on his right arm. So I asked you “Is he left handed?” I was correct. My family is left handed too. Myself and my two sons as well as my father-in-law. Yes, there are challenges being left handed, but we are strong and in most cases overcome the majority of the impositions that have been presented to us. I am confident your son has overcome the daily issues presented to him. I see another post referring to shooting sports. After some practice in my youth a right handed bolt rifle became natural to me. In that sport I am lucky to be both left eye dominate and left handed. My left handed son is right eye dominate. After a few times shooting he mounted his gun on his right shoulder and learned to shoot “Righty” (trader!) I was once shown a left handed revolver, the most awkward thing I ever held. I have not only overcome the issues of a right handed revolver design but I have used in the right handed design to my advantage. In short “correctly handed” people have adapted and overcome many right handed situations presented to us. I think one of the most common righty things we see is the tape rule??? Think about it. It is stretched out for use being held in the left hand, so that when stretched out the right hand is free to write down the measurement with the right hand. Well lefties have adapted and overcome that imposition. We are capable of reading the upside down numbers on the righty rule when the tape rule is stretched out with the right hand!!! Simple, yes, but just one of the conditions lefties have adapted too. BTW I was 40 before a carpenter pointed out that the numbers were upside down. The numbers bing upside down was and is normal to me. Very interesting! Thanks for sharing this! I see Tom wears a watch on his right hand making adjustments while wearing it very difficult. As a lefty myself, I grew up seeing my right-handed dad wear his watch on his left hand. Because of that I wear my watch on my left hand just like him. Switching just doesn’t feel right. I just have to kept in mind possible damage if doing any kind of work that could damage it, like swinging a hammer. I too am left eye dominant and right handed so it makes shooting difficult. A pistol is no problem as I can shift my head but shooting a long gun is much harder. I had to learn to use my left hand and it took a long time before I could shoot accurately. 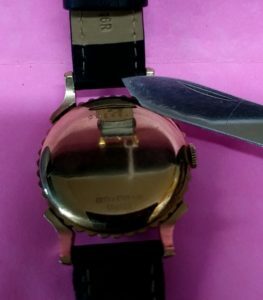 For WIW, none of my watches have exhibited any recoil problems when I use my left hand. Mark keeps them in good shape. I use both hands and my brother does also. I am both/neither eye dominant. My brother shoots a rifle and shotgun left handed and shoots a pistol right handed. My daughter and son-in-law and cousin and nephew are left handed. My brother and I would practice baseball as teenagers and switch from left to right with which hand caught or threw the ball. We would see how fast we could switch until one of us missed a catch. Each catch or pitch had to be alternated from hand to hand. I was at a meeting of a Woodturning club at IUP last evening. Of the 20 or so people who were there I think that about half were left handed. It’s, usually (but not always) easy to tell by which wrist they use for their watch. Mark! So happy to have found your blog, great article! I am a left-handed apprentice watchmaker working under a right-handed watchmaker and like your son, I am having such difficulty with the snap back cases. I’ve started two weeks ago and have not yet figured out a solution. I am hoping that you would share any insight you have from your son, it would be so greatly appreciated. I don’t want anything to slow my progress in this career because I have finally found my niche. Thanks so much for your time, I can’t wait to explore your blog!